Mandibeads: Bash Voted "Best One-Stop Shop!" Holy cow holy cow!! 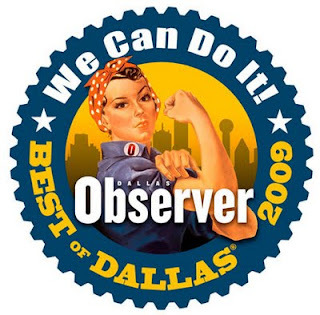 Our Bash shows were just voted as Dallas' "Best One-Stop Shop" in the coveted and uber popular Dallas Observer's Best Of annual issue. It's on stands today!! Sure etsy.com—the online boutique community for crafters, jewelry designers, knitters, tailors, bookbinders, vintage sellers and collectors of everything—is a surefire way to kill an afternoon and build up a wish list, but an Etsy Dallas event is even better. Prices are great, the craftsmanship is fantastic, it feels good to support local crafters and you'll still cover everyone on any gift list you might have for the next two years. But the downside is you'll also empty your bank account with little to no effort without some preventive measures. We have a friend keep us from purchasing on the first lap through the show. We spend only cash (even if a booth takes cards). And we buy no more than we can carry on our own person. It's hard, but, well, you gotta leave something for the rest of the shoppers to look at. On the other hand, screw everyone else, retail therapy rocks! The Etsy Dallas Jingle Bash takes place November 21 at Sons of Hermann Hall. Sharp elbows stimulate the economy, people. In case you're wondering, What the heck is the Bash?, let me fill you in. The Bash is the premier arts and crafts event in Dallas that we started back in 2008. The Bash is put on by Tefi Designs and Pamela Michelle, with support from the Etsy Dallas leadership team: Larry, Carrie, Cheyne, Alicia, Mandi (that's me :), Dylan, and Randi. This year's 2nd Annual Jingle Bash will take place at the historic (and somewhat David-Lynchian) Sons of Hermann Hall, November 21st (that's a Saturday) from 1am-7pm. More deets here.